Even though Chuck Asay is one of my favorite cartoonists (see here, here, here, here, and here), I was not a big fan of one of his recent two-frame cartoons. But he has more than made up for that slight transgression with this new gem. 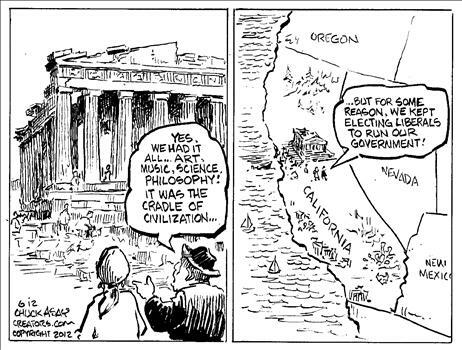 I’m biased, of course, since I’ve already written about California being the Greece of America, but there’s plenty of evidence to justify Asay’s cartoon. California already has some of the highest tax rates in America, resulting in Laffer Curve responses that reduce tax revenue. California has violated Mitchell’s Golden Rule, letting government spending grow faster than the productive sector of the economy. California over-compensates government employees, distorting labor markets and imposing ever-growing burdens on taxpayers. California is throwing good money after bad with subsidies for so-called high-speed rail. California is suffocating from a knee-jerk impulse for more red tape, regulation, and intervention in almost every area of life, from higher education to babysitting. It’s hard to see how a state survives, in the long run, with such a burdensome government. While the cartoon is designed to be funny, it also make a valid point since the Golden State is copying the mistakes that are causing Greece to collapse. That being said, California can be saved. I already mentioned this morning that voters in San Diego and San Jose voted overwhelmingly to trim the excessive benefits promised to government bureaucrats. But I also should have mentioned that California voters rejected a statewide referendum to boost tobacco taxes. But the real test will be this November, when voters will be asked whether to vote for a huge income tax increase so that Governor Jerry Brown and the crowd in Sacramento can keep the gravy train rolling along for a few more years. If voters resist the Washington-Monument-Syndrome demagoguery of the political elite and reject the class-warfare tax hike, then it’s possible that lawmakers will finally do the right thing and reduce the size and scope of California’s government. I don’t think there’s any chance that California will become another Texas. But there’s a greater-than-zero chance that the state can pull itself back from the Grecian Abyss. Dan, you failed to note that the people who have come closest to a balanced budget, and coincidentally, have done the most to promote free enterprise in California, are Democrats, “liberals” by your definition, including the current Gov. Jerry Brown. California’s problems do not stem from too much taxes, too much government, and too much spending, but from something quite the opposite. Years ago, probably before you were born, California voters got suckered into passing a Proposition 13, which limited spending dramatically and made it difficult to raise taxes. Consequently, to keep giving handouts to the wealthy in the form of reduced taxes, California had to cut spending on children, especially in education. When Prop 13 passed, California had free tuition at two series of great state university systems, arguably the two best university systems in the U.S.; public schools offered a lot of electives in artistic fields, and up to five different languages in middle schools and high school. California kids scored at or near the the top of many interstate comparison tests. Roads were great, which led to a flood of industrial locations in California, where raw materials could easily come in and finished goods could easily be transported to national and international markets. Bright, young entrepreneurs flooded into the state and created huge pockets of new industrial development and product development, enticed by a great systems of public parks and aggressive environmental protection which improved the health of citizens and provided fantastic recreational opportunities, in the oceans, deserts and mountains. After four decades of failing to keep up those systems, now at last California is in trouble. Even today Californians have better health than Texas. California leads Texas in business development. Texas basks in the glow of California-born companies that put outposts in Texas — Apple, and Hewlett-Packard, and Lockheed-Martin, among others. Texas is rushing to screw up what it had right, following California’s example. Your comparisons should note where Texas is on the Prop 13 Failure Curve (“Laffer curve?” Laffer never could put numbers to that idea; is there any serious economic work that supports the claims you make for Laffer’s now-defunct idea?). Texas is slashing spending on education, health care, agricultural support, and roads. Texas is losing traditional industries it had by dint of being in the right place — beef has been cut by 50% in the last two years; cotton farming is near failure because of Texas’s failure to protect, preserve and recharge water resources. Prince Georges County, Maryland, was the first American municipality to follow California’s Prop 13 madness. By 1983, PG County schools were disasters, and so were the roads. Marylanders saw the light and repealed the TRIM Amendment, and Prince Georges County is booming today. If you won’t pay attention to the economics and failed theories there, won’t you at least pay attention to the actual history? As a Native Californian in voluntary exile in Oregon, I find it disturbing that the idiots in Sactown are still driving hard and fast into a brick wall! California presents an interesting dichotomy: on one hand, the state is very conservative with regards to taxes. On the other hand, the majorities in San Fransicko and LALA land constantly send libtards to Sactown! California was once one of the most conservative states in the country, but that started to change in the ’60s. But, in the 58 counties, the majority of them remain conservative. You’d never know this with libtards always screaming the CA is blue! CA needs to finally reject the socialist nightmare, and return to the values that once made it the 6th largest economy in the world, or else fall like Greece! It is nice to fantasize that California’s decline can be contained. Alas, Californians together with a few other states, will first vote the rest of the nation’s wallets away before going down. That is what is currently happening in Europe. So prepare for calls to interstate solidarity and rhetoric about how Americans must all unite to be “strong” and survive the challenge of three billion emerging and liberating world souls. The dream of prosperity through flatter effort-reward curves lives on — the decline accelerates. The real test won’t be in November. The real test will be when the california courts decide proposition B is unconstitutional. Liberals still have their back stop with the courts over ruling the people’s choices. New Mexico next to California? Simple mistake or is he trying to say something else? 22nd century? This could next week.